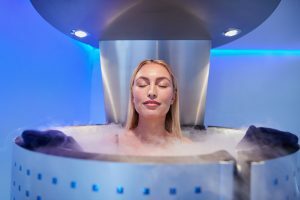 Cryotherapy is the utilization of cold temperatures upon the body for the purpose of gaining health benefits associated with exposure to the extreme cold, for brief periods of time. Okay, well what are some of the benefits? Athletes utilize ice baths to promote muscle recovery, and cryotherapy acts like an extreme ice bath by putting the body into similar freezing temperatures. But unlike an ice bath, the duration is shorter and no one gets wet. Cryotherapy can also reduce inflammation, promote cell restoration, and shrink the pores of the skin. A chamber or room is cooled to a freezing -200 degrees Fahrenheit, though the exact temperature varies upon location. To reach this chilling temperature Nitrogen gas is used inside the chamber or room. Nitrogen gas is able to be used because it has an extremely low boiling point (that’s what makes it so cold), which allows it to evaporate at room temperature. This gas is also non-toxic! What involved is the process? A client is given a robe, socks, and gloves. When they arrive to the cryotherapy chamber they remove the robe, but keep their undergarments, gloves, and socks on to enter the chamber. Once inside the chamber, they remain standing in the chamber for 2-3 minutes and then step out. It is as simple as that! No need to shower or dry off! Now that you know a bit more about the process of Cryotherapy—schedule your appointment today with Goosebumps Cryotherapy! We are a Colorado based company with cryotherapy in Colorado Springs. Our facility is equipped with cryotherapy chambers, also known as cold therapy machines, to provide our clientele with optimized cryotherapy sessions to maximize the benefits of cryotherapy! Give it a try today!